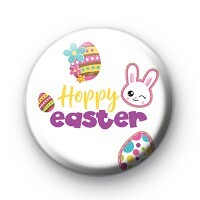 Super cute Easter themed pin badge with the fun slogan 'Hoppy Easter' with a sweet bunny and pretty Easter egg designs. Easter Egg, and Easter Bunny. Our Easter badges are really popular each year. Parents give them to their children and teachers hand them out at school. They are perfect pinned to your school uniform and great for merit badges and prizes during the Easter period. Not as tasty as a chocolate egg but a fun addition to Easter. All of our badges are 25mm badges and hand made by us in our UK workshop. Standard 1 inch badge with copper pin back.